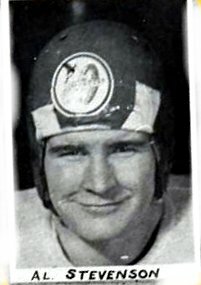 Al Stevenson played for the Montreal Hornets in 1945 and then joined the new Montreal Alouettes franchise for the 1946 season. Stevenson played six seasons in total for the Als (1946-51) and won a Grey Cup with them in 1949. After retiring as a football player, Stevenson purused a career in the Canadian Army. Stevenson served as an assistant coach for the Royal Military Colleged (RMC) at Kingston under another former CFL player, Tony Golab and also coached the second team. Al Stevenson was killed in a car accident on January 4, 1958. Official gams played stats were not kept in the East until 1960. The numbers above are from the 2006 Montreal Media Guide and are unofficial.